If you are missing one or more of your adult teeth, you're not alone — an estimated 178 million Americans have the same condition. Many try to get along without all of their teeth, and suffer from some of the familiar problems that go with the territory: smiles that don't look as appealing as they once did, problems eating certain foods, and awkwardness or embarrassment in social situations. Yet there are other problems associated with tooth loss that are less obvious, but could have more of an impact on your health. These include nutritional difficulties, oral health issues, and bone loss. It is well established that eating plenty of fruits and vegetables and avoiding highly processed foods are essential parts of good nutrition. But many foods become difficult to chew if you have missing teeth — and those “challenging” foods are often the same ones that offer the greatest nutritional value. Softer foods are easier to eat, but they are often highly processed, and offer little nutritional value. Along with the possibility of malnourishment, a poor diet can lead to a compromised immune system and a decline in overall health. If you have only one or two missing teeth, you may not feel an urgent need to replace them now. Yet the problems that stem from missing teeth don't get better — and in time, they can get much worse. Teeth aren't fixed solidly in the jaw; instead, when even one tooth is missing, the remaining teeth tend to “drift” into new positions. This can cause a cascade of oral health problems, including unstable tooth positions, excessive tooth wear, bite problems, a greater chance of developing tooth decay and periodontal disease — and the loss of even more teeth. You can't see the bone inside your jaw — but the consequences of bone loss are very real. Bone tissue needs stimulation to maintain its volume and density. 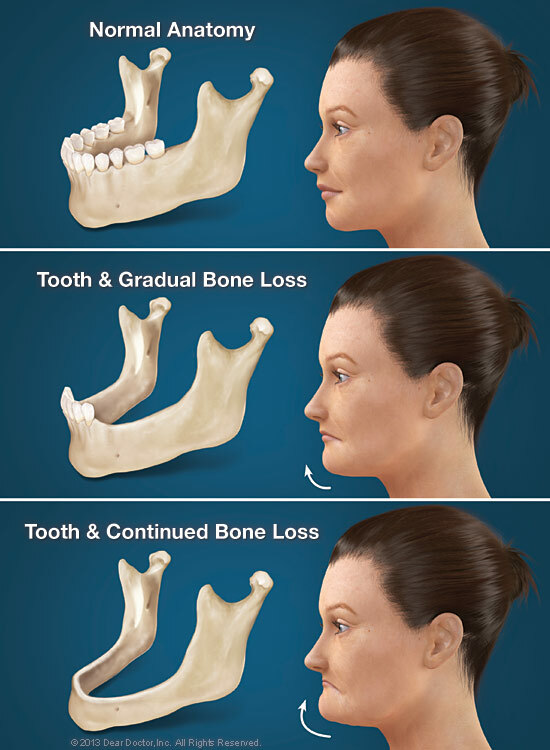 When teeth are lost, the jaw bone that once supported them loses stimulation and begins to deteriorate. It can lose one-quarter of its width in just one year, and even more as time passes. As the jaw becomes smaller, facial height (the distance from nose to chin) decreases, and facial features lose support. The chin rotates forward, the corners of the mouth turn downward (as if frowning), and the cheeks can appear hollow. Loss of bone in the jaw can give you the appearance of being many years older than you actually are. The consequences of tooth loss are very real, even if they are less visible than a gap in your smile. That's why it is so important not to put off the replacement of missing teeth.